Conscious capital and innovative partnerships create thriving communities. We want not just to expand economic opportunities in low-income communities. We don't only want to contribute to the production of quality affordable housing, or improved facilities for high-performing schools. Rather, it is the sum of all those parts and more that we seek--it is the creation of thriving communities. A thriving community has opportunities to earn an income and build wealth, it has residents who don't feel the stress of housing insecurity, and it has schools that equip students to reach their potential. But it also has happy, fulfilled people, neighborhood pride, big dreamers, and the comfort of safety. Helping all communities thrive is what our work is all about. ​With the goal defined, the next step was figuring out how we can pursue such an ambitious vision. We concluded that conscious capital and innovative partnerships are the two critical, non-negotiable ingredients that will be core to our success. Conscious capital acknowledges that money is necessary to move the needle on these intractable problems, and it has to be money that's used in a thoughtful, human-first way. It's capitalism that understands and privileges the simple idea that people are greater than profit. ​Innovative partnerships are so important to us because while we are ambitious, we know that we can't make the big changes that we believe in on our own. We need to bring our specific skill set to the table and combine that with the expertise and capacity of our collaborators to maximize our impact. We need to encourage ourselves and others to think differently, act boldly, and work together to drive positive change. ​Our vision statement is a commitment. It is a motivator. And it is our greatest dream as a company. We invite you to join us as we bring it to life. 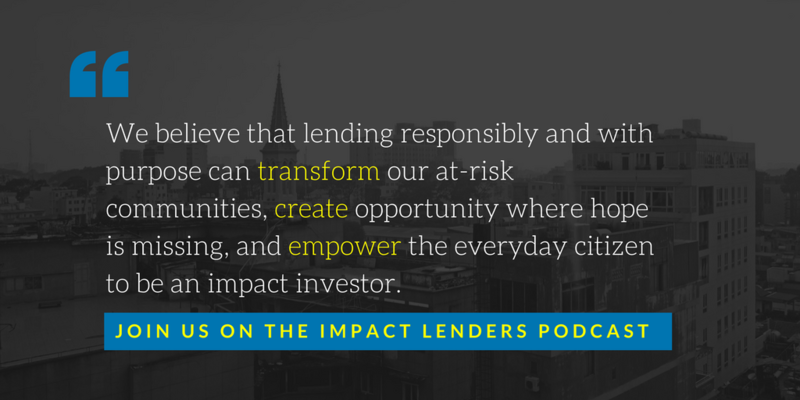 We are excited to announce the Impact Lenders Podcast, a new biweekly podcast that focuses on using lending as a force for good. Through interviews with executives, lenders, and other staff who carry out the important work of nonprofit loan funds, foundations, CDFI banks and credit unions, government entities, and their partner institutions, we will give you inspiration for your own work, remind you why you got into this field in the first place, and improve your knowledge of the field. Many of our discussions will be about affordable housing development, the growth and management of nonprofit loan funds, small business lending, commercial real estate in underserved communities, school facility development, and economic development. One of our goals as a company is to be a knowledge base for the industry, and this podcast is an extension of that goal. We hope we’ll entertain and inform, and we are excited to showcase the many great people in this industry on our show. The first episode will be released on 4.4.2018. We look forward to hearing your feedback and hope you will enjoy the show. You’ve just closed a loan for a residential conversion of a commercial property. The LTV is on target and the DCR is sound. Then you pick up the paper and read an article like this, detailing how the residential-only property isn’t actually eligible for the mixed-use real estate tax exemption it was granted. This is in many ways a nightmare scenario for any lender (including at least one CDFI that financed some of the properties in question): you have done your due diligence, requiring proof of approval for the exemption that makes the project viable, and now it turns out that the exemption was granted in error and will be rescinded. What are the next steps? This search could have prompted questions from the underwriter regarding why the residential use conversion was eligible. It is very possible that the in-hand approval still would have won the argument, but this would have given the lender one more chance to avoid becoming victim to the city’s mistake. Look Forward: When an issue like this surfaces, it is critical to be proactive in your response. The city made a mistake, and now has to figure out how to correct it. You and your borrower should both be at the table for that discussion, advocating for a fair approach that recognizes that investment decisions were made based on the city’s misstep. Pat Yourself on the Back: Perhaps due diligence didn’t go quite as far as it could have, but you still may be in good position because you are actively monitoring your portfolio and the markets you serve, so you were the first to hear about the issue. You have maintained excellent relationships with your borrower, so they are likely to do what they can to ensure that you are made whole in the end. You are also in good standing with local politicians, giving you a better chance of convincing them that city hall needs to limit the collateral damage of its mistake. Even good underwriting can be undermined by surprises like this. Thankfully, this specific scenario is rare, but it should provide a strong reminder to go the extra mile in your underwriting, monitor your portfolio and lending markets diligently, and maintain excellent relationships with your borrowers and local government. In community development, nothing is a sure thing. Except, that is, excellent service from High Impact. ​Contact us today to discuss your underwriting, portfolio management, and program development needs. ​The final FY18 federal budget will likely be much different than the president’s “skinny budget” proposal, but nevertheless, the threat to eliminate programs like Community Development Block Grants and severely cut others like Section 8 housing vouchers underscores the risk associated with subsidy programs. Carefully evaluating all capital grants, operating subsidies, and credit enhancements is essential to effective risk management for CDFIs. How best to address the uncertainty? Strong underwriting and prudent monitoring. Verify program requirements independently. Understanding program guidelines and conditions on subsidy awards is essential to sound underwriting. If a subsidy source is involved in the phase of the project you’re financing (such as a construction subsidy that will come in during your construction loan term), make sure to review the executed grant agreement prior to closing. Key terms to consider include conditions precedent to funding, retainage, limitations on funding reimbursements versus costs incurred, and events triggering repayment. If a subsidy source is part of your planned take-out, you may not be able to get a signed (or even draft) grant agreement. Instead, go to the funding agency’s website to read about the program terms, and call the agency to discuss terms if you need clarification. Understand the source of subsidy funds. Are funds coming from the municipal, state, or federal government? Has funding for the subsidy already been approved, or will it be approved as part of a future year’s budget? The answers to these questions determine the risk involved. A closer look may be necessary for particularly important subsidies—for example, if a project works with a HAP contract but doesn’t without it, you may want to read into the current politics around HUD funding. If a municipal subsidy is key to the plan, you may want to call around to understand how internal politics, newly elected leadership, and unwritten priorities might affect who receives a subsidy. Consider the borrower’s experience. A borrower’s experience obtaining and using a specific subsidy source provides a barometer of the likelihood that they will be able to access it again. When underwriting a subsidy whose exact value may change (based on tax credit pricing, for example) or which will be uncommitted at closing of your loan, borrower experience may help mitigate the risk that the planned subsidy is reduced or falls through. A borrower who survived the recession and has a history of cobbling together various funding sources to make projects work may be more likely to push a challenged project through successfully than one who is newer and has fewer relationships with funders. Monitor closed loans with an eye toward subsidy risks. Making sure your loan administration team understands your expectations for when subsidy will come into the deal is vital for effective oversight of construction draws. To monitor subsidy sources of take-out, set up checkpoints (either through the loan review process, milestone covenants in loan documents, or informal ticklers) to get updates on the status of subsidy applications, commitments, and closing timelines. The earlier you identify an issue, the easier it may be to resolve. Keep watch on portfolio-wide exposure. Over-exposure to a single program or funding source is a key form of concentration risk that is often overlooked. Is 50% of your portfolio dependent upon Section 8 payments from tenants? LIHTC rates holding steady? Take-out by a state-funded program? Consider tracking subsidy exposure and adjusting your risk position through geographic dispersion, new business development in a different financing product or lending sector, or by allowing subsidy exposure to inform other lending parameters. Concentration risk may be unavoidable, but any CDFI can take steps to reduce the size of the risk. We hope you will use some or all of these strategies to proactively monitor and mitigate risk for your institution. Exposure to subsidy risk goes hand-in-hand with community development finance—let’s make smart risk management just as common. Would you like a hand implementing any of these ideas? Give us a call: (518) 599-0482.